Valuation Class and how to Post Materials to GL? What is the use valuation classes? How are materials posting to GL, if it is through valuation classes then how we can create and link valuation class with GL account? Read here at SAP FICO Forum to Get Answer for More Questions like the above mentioned. You group together different materials with similar properties into valuation classes so that you do not have to manage a separate stock account for every material. All materials with the same material type are assigned to just one valuation class. Different materials with the same material type are assigned to different valuation classes. Materials with different material types are assigned to a single valuation class. 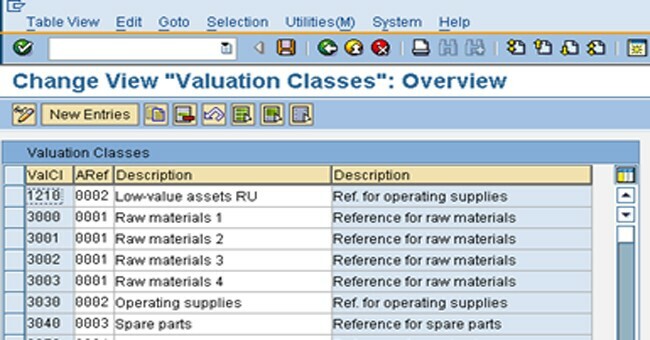 A material is assigned to a valuation class in the material master record. The system checks whether the material type allows the material to be assigned to the valuation class specified. The system refers to the valuation class of a material to determine which stock account to post to when a posting is made for this material. 1. In the accounting view of Material Master (Material master has various views eg., Basic views, Purchasing views, Production, Sales and Distribution, Accounting and Controlling views) amongst other values we have a Valuation Class field. This Valuation class is the vital link which ensures that Accounting documents are posted automatically. Every material will have a valuation class field. Examples of Valuation Class might be Finished Goods, Raw Materials etc. 2. The combination of this Valuation Class and the Movement Type helps in determining the Gl accounts. GL accounts are automatically updated with this combination with the help of transaction key for the GL code available using the transaction code OBYC. How can we change Valuation class? Thanks for logical part of the MM FI integration. Could you further elaborate which T. Code is used for customizing the assignments mentioned by you?